With all of the information you can track with Einstime, you'll want a flexible search engine that can instantly locate events, appointments, tasks, notes and people. Einstime's Search tool meets that need. 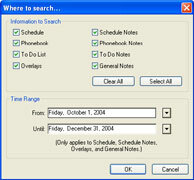 Select any search result and Einstime will immediately recall the information for you in its appropiate tool window.